Among Chopin’s master interpreters, few attained the level of Ignaz Friedman, Ignace Tiegerman, and Severin Eisenberger. After extensive restoration these classic performances live in a greater clarity through uncompressed sound. Heard here are unissued and unknown performances by these three artists, a further illumination of their profound musicianship. With them is Henri Barda performing a work by Tiegerman. Barda carries on their grand tradition. CD 4 also contains audio interviews, scans of Friedman’s Chopin Etudes (Instructive Edition), photos, and more documentation, all accessible via computer. Tiegerman’s complete recordings in a new restoration. Brahms conducted by Oreste Campisi with the Cairo Symphony Orchestra. Franck and Saint-Saëns conducted by Jose Ferriz with the Cairo Symphony Orchestra. Tiegerman’s complete recordings with discoveries supplementing the earlier extant material. Henri Barda plays a composition by Tiegerman, his teacher. Barda is his musical heir. Severin Eisenberger’s Chopin concerto is newly restored along with the first appearance of his Kodaly. Alexander von Kreisler conducts the Cincinnati Conservatory Orchestra. What happened to Chopin’s art? Details written down by pupils and friends enlighten us with musical and personal characteristics, all describe how his free playing and liberties were cloaked in a semblance of order, highly lyrical expression, a unique sound world of great subtlety and perhaps the most daring exploration of the instrument’s timbres through clashing registers and densities, innovative form, and structure. Chopin’s manuscripts seem like recollections of experiences defying capture, faint notes in a small hand so unlike their dramatic content. Recording technology came too late, leaving only their words and Chopin’s meager sketches for an incomplete piano method. His unique art vanished into air. During his life, Chopin’s music ignited a momentum that grew to an industrial level of activity through numerous editions, ongoing critical analyses, articles, books, a ceaseless flow of recordings and performances, and continual study of nearly every Chopin piece by all pianists who play professionally or for pleasure. Amidst all this commotion, something is overlooked: the composer’s own playing, and its fate. Did it continue in some way? If one hears recordings by later composers, freshness and a musical quality of openness creates a suggestion of something intangible. Their documents also carry the impact of how a composition’s arrival is like an explosion, after which entropy sets in when the composer’s listeners and pupils adoringly elevate the work onto a pedestal. What was a rugged objet trouvÃ© in the composer’s hands becomes an item given a respect that limits any tendency towards extreme playing, even if the creator wished so. Composers face the transition of their work into classical permanence. This post-creation phase ends as soon as the successive generation decides to revisit the music and strip away the earlier reverence and mannerisms, ending up with a modernism that re-evaluates notes and meaning. Grieg heard two generations of pianists shape his works and praised their diverse ways. Compare the Norwegian Bridal Procession as played by Johanna Stockmarr, Arthur De Greef, and Percy Grainger (all of whose playing he approved) with Grieg himself, who impresses as being the most youthful and impulsive. Modernism eventually becomes status quo: the next wave turns to manuscripts and first editions, ending up short by overlooking recorded evidence. Clues are found in recordings of several nineteenth century pianists. The legato touch Chopin developed was mastered and transmitted as a craft by Mikuli, who imparted it to Moriz Rosenthal and Roza Wagner Horszowska (first teacher of her son Mieczyslaw Horszowski). Francis PlantÃ©’s vigor and clarity developed in three decades of playing with Chopin’s cellist Franchomme. Friedman, Tiegerman, and Eisenberger were indirectly linked to the composer through their teacher Theodor Leschetizky (1830-1915), who grew up on the Potocki estate, knew Liszt and at least one Chopin pupil. Leschetizky was a remarkable mimic of other pianists’ interpretations: Anton Rubinstein had such a strong influence that Friedman and Mark Hambourg’s playing often resembled Rubinstein without their knowing so: Friedman never heard him yet some older listeners detected a similarity. Both Eisenberger and Friedman first studied with Flora Grzywinska in KrakÃ³w: Friedman credited her with developing his extraordinary technique. The two pianists left examples of mazurkas: Friedman a group of twelve, Eisenberger in Chopin’s Second Concerto, third movement. Eyewitnesses described Chopin’s mazurka playing as having duple meter, a gait Chopin ascribed to its folk origins. Contemporary mazurka style lacks such shaping, an awkward handling of a tongue no longer spoken. Anyone presuming that 19th century artists were in closer contact to the mazurka style origins will find very few convincing examples: Auguste de Radwan, a count and Paris-based pianist who reviewed for the French journal described by Ferruccio Busoni and Isidor Philipp as L’Immonde Musical raved over Friedman’s Bach-Busoni and Schumann yet termed his Chopin a butchery. He remains one of the few who sound convincingly authentic with the irregular beats and accents. Several of Pachmann’s mazurkas convey this practice, perhaps a result of private coaching with Vera Kologrivoff Rubio, Chopin’s last assistant. Rosenthal’s mazurkas are appealing and contemplative, yet more Viennese than Polish. Friedman’s mazurkas bear the closest resemblance to descriptions of Chopin’s own, perhaps from having danced them in villages as a child, a rare crossing of social boundaries into the peasant’s world. Eisenberger, who grew up in the same KrakÃ³w suburb as Friedman, also enlivened the dance’s unique shape. Hardly any other examples convince as theirs. Eisenberger and Friedman’s shared tonal conception, phrasing, and articulation imply a tradition that stems from the composer. Eisenberger’s rubato and ornamentation in the second concerto remain an exemplary ideal, illustrating Leschetizky’s definition of fioriture as refractions cast by sonic prisms rather than tapestry hanging above a laboring left hand. The second movement opens with an oracular arpeggio, a charged moment of transition that is so often reduced to an athletic warm-up. The concerto is also the sole example of Eisenberger’s Chopin. Eisenberger is the only recorded pianist to study with two Czerny pupils (Leschetizky and Ehrlich) and his mastery of Beethoven’s style is evident in four concerti captured on 1937 broadcasts. He played the Kodaly pieces after the Beethoven. Kodaly continued the experimentation Chopin applied to mazurka forms. He was fortunate enough to have fully immersed himself in living folk traditions by collecting and documenting in situ, adapting melodies and idioms into his compositional language. Kodaly burns with passion over the Transylvanian Szeklar (SzÃ©kely) melodies he personally retrieved from villagers: here he sets a ritual lament and an instrumental tune. Eisenberger conveys the excitement of Kodaly’s discoveries from the perspective of an urbanite using a virtuosic setting. New to American listeners in 1937, the radio announcer referred to him as “Co-dally”. Ignace Tiegerman bristled at being called “maestro”, insisting that he was a pianist whose only goal in life was to play well. His keen understanding of musical form and structure were supported by a formidable technique. More important, there were no limits to his realizing and projecting the music’s full emotional impact, for he never held back and kept all in proportion, playing in a vibrant state of grace. More than anyone, the treatment given to every composition he touches has the explosive impulse of a work’s birth. And with the discovery of his recordings only some ten years ago, this writer wondered how he would be received by a new generation unfamiliar with him and his world, by pianists about to become performers and educators. “Its structure has elements of both sonata form and variations. The main melody suffers all kinds of transformations, such as embellishment and contrapuntal interaction, while the second subject, a chorale, appears briefly and only returns as a culmination of the reprise, before the coda. “After hearing the recording of Friedman playing this nocturne, my thoughts about the way to play Chopin changed regarding the rubato and the voicing. Many teachers taught me to play in a much more classical way. A very strict tempo and restricted rubato have always been values taught by most teachers in many of the music schools. [A problem even in Friedman’s time.] Although I played Chopin in a much more academic way without that much freedom of rubato, I always felt I did not follow my innermost feelings and instincts about Chopin’s music. The repertoire heard here includes works by other composers and reveals the pianists’ broad mastery of styles and genres. A search for many decades has added ten more minutes to Friedman’s body of recordings. An unpublished Liszt-Paganini-Busoni-Friedman La Campanella was approved at a session using an acoustic recording horn. With microphone (electrical) recordings coming soon after, it lay forgotten, unpublished for nearly ninety years. Friedman’s well-known remake finds him abruptly ending the etude before the score’s final page, causing one to wonder how he had accented or syncopated the rhythms: now we know. A metal disc was unboxed from its sealed wooden crate, played perhaps for the first time, illustrating Friedman’s laughing away at technical obstacles, especially in the prolonged trill, a tour de force played quite differently here than on his published version. A recent fortuitous discovery brought to light another Chopin Polonaise op. 53, one listed as an approved unissued performance by Friedman from 1933 that only survived when its masters were shipped to Argentina for local stamping, eluding every self-described ‘complete edition’ to date. The Chopin specialist Raoul Koczalski, a self-proclaimed heir to Mikuli, takes this polonaise’s improvisatory G major section (before the main theme’s last statement) with utter indifference to the left hand, ploddingly repeated as a dull accompanying pattern in the very spot where musical action takes place on a two-dimensional scale. Friedman delineates a bass descent in the first phrase, followed by a projection of supporting harmonic shifts under a right hand articulating a statically melodic pattern. Koczalski instead reduces both parts to vagueness, pacing impatiently until finding relief in the opening’s return. While Koczalski studied with Chopin’s assistant Mikuli, Friedman had no links to Chopin’s pupils yet reveals the composition more than the pedigree-bearer. In his two versions of the Op. 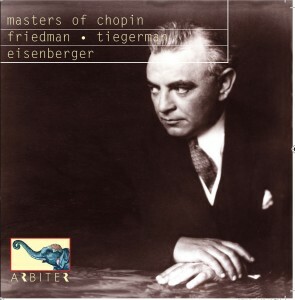 53, a stronger emphasis of detail is present in 1927, one that never fails to startle listeners who expect serious music to be polite, not overplayed, even though the details are Chopin’s: Friedman enjoys placing in relief what often goes unobserved. The 1933 performance avoids octave doublings, the timing and phrasing are similar, showing that a conception remained steady in a work he programmed weekly throughout his entire career. Many passages and accented tones impress as being improvisatory and spontaneous, but in both we hear how they are integrated. A radiant artist, there is an atypical sadness and detachment in this 1933 performance, made around the time of his mother’s death and cancellation of all German tours, all ties to his Berlin life and home severed. Eisenberger’s Chopin appeared some twenty years ago on CD: our new restoration vastly improves the earlier sonics. Tiegerman was also ripe for renovation, as ten years passed since the discovery and publication of his recordings, during which restoration methods advanced. There is greater presence of tone, touch, and his incomparable temperament is even more incendiary. Arbiter’s agony in lacking space for a half hour of his playing in the first edition is now rectified with nearly every extant performance published, including the Chopin nocturne encore from his farewell recital, the last notes he offered in public. Tiegerman’s singing a la Glenn Gould is also more audible. Evans, Allan. 2009. Ignaz Friedman: Romantic Master Pianist. Bloomington: Indiana University Press.